I thought it would be interesting to share the county organization of the state of Hawaii with you. As we explore the counties of Hawaii, we’ll start North with Kauai and work our way South to Hawaii’s Big Island. While we’re looking at each county, I’ll link to the county’s Web site. I’d encourage you to have a look around the Web site for the county that you’ll be visiting. These resourceful Web sites will help you find useful information for your vacation. You’ll find information on county beach parks and their facilities. You’ll discover parks where you can play tennis. You’ll also find out how to obtain a camping permit. You’ll also learn about the public transport schedules and routes. You’ll learn where to recycle. Niihau and Kauai islands are part of Kauai County. This Hawaii county has a population of 63,000 with almost all people residing on Kauai island. Here is the county’s official Web site. The entire island of Oahu is Honolulu County. It is the most populated county with almost 910,000 residents, most live in the city of Honolulu. The official Honolulu county and city Web site is here. 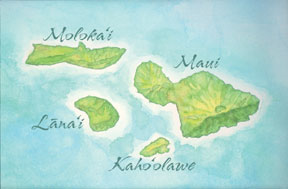 Maui County consists of four islands – Maui, Molokai (with the exception of the Kalaupapa peninsula), Lanai and Kahoolawe. These islands are also referred to as Maui Nui which means ‘Big Maui.” The population of Maui County is approximately 134,000 with most (124,000) county residents living on Maui. Molokai is home to 7,000 resident and Lanai has around 3,000. Here is the link to Maui County’s official Web site. The largest Hawaiian Island, Hawaii’s Big Island, is Hawaii County. 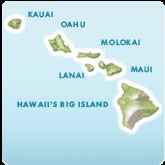 In terms of land mass size, Hawaii County is bigger than all the other counties combined. Hawaii County’s population is approximately 171,000 people. Their official Web site is here. I wish they would rename Honolulu county to Oahu county to make it more consistent with the other Hawaii county names. I live on the other side of the island of Oahu so why should I be part of Honolulu instead of the island of Oahu? Hi Chris – Yeah that is a bit strange. Occasionally I’ve heard people refer to Oahu as the island of Honolulu. Aloha! My fiance’ and I are getting married in May and looking to spend our honeymoon here. Any special places we should visit and where can we get the best and most economical seafood on the island? We don’t have any printed materials at all. Check a book store or Amazon to purchase maps.